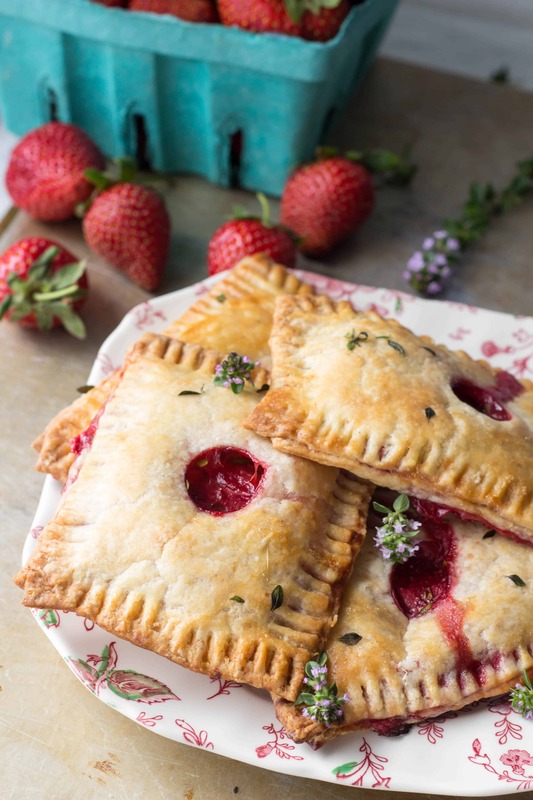 This sweet and savory combination of strawberries and goat cheese wrapped in a flaky pastry makes an amazing breakfast or brunch treat! It’s hard going through life not knowing who you are. But it happens to most of us, doesn’t it? I seem to go through periods of feeling really confident in knowing who I am, and other times being completely clueless. “Who am I?” Please tell me I’m not the only one who goes through life saying this… with expletives… every couple of years? These “pastries” are going through the same thing. They’re having a bit of an identity crisis, and I totally feel for them. When something tastes this good, I don’t think labels should really matter. Strawberry season has a very short window here in South Jersey, and we’re smack dab in the middle of it right now. I’ve been picking boatloads of strawberries from my garden, which will never cease to be an amazing and exciting experience for me. On top of that, I’ve been buying up berries from the farmer’s market like nobody’s business. They’re just so tiny, so deep red in color, so sweet and so full of ripe strawberry flavor. Those big honkin’ flavorless berries from California? They can’t hold a candle to these little gems. I’ve been hoarding them in my fridge and freezer like a crazy person, holding out for the very best things to make with them, trying desperately to divert someone from just throwing them into a smoothie. Strawberries and goat cheese are a natural pair. 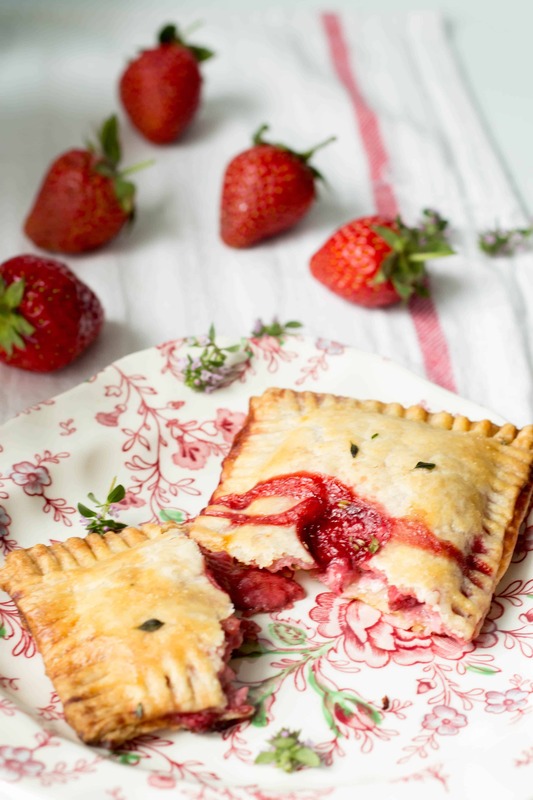 The tangy, creamy cheese is just lovely against the sweet-tart strawberry filling. 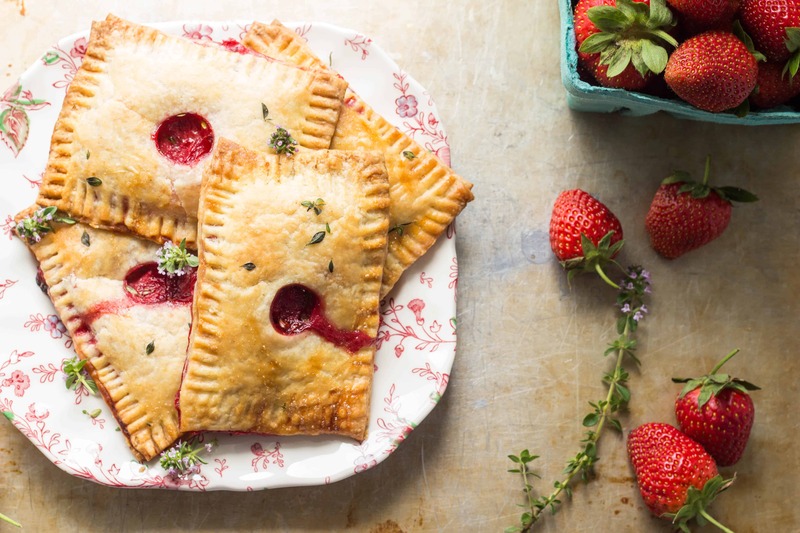 A sprinkling of lemon thyme and sea salt bring these over just a smidge to the savory side, but if you swap that out for a little raw sugar instead, you’ve easily got yourself a dessert. To make these, I switched up my standard pie crust just a bit and added an egg yolk for stability, plus a wee bit of cornmeal for a different texture. That cornmeal crust is everything! The crunch completely addictive. The dough gets split into two, then rolled out nice and thin, filled, sealed and baked. The tops will need to be vented to let out a little steam, so I opted to use the wide side of a pastry bag tip to cut out little holes. It didn’t occur to me that they look like bloody gunshot wounds until Chaser mentioned it, and now I can’t get the image out of my head. Ho hum. So unless it’s Halloween, you might want to consider using a different venting method. These pastries make such a fun and unique appetizer. Who wouldn’t be stoked to nosh on one at a sunny outdoor party along with a spritzy summer cocktail? But my favorite way to eat them is in the morning, with a good cup of coffee and a few rays of sunshine. Whip up a batch, give a few out to your friends, and then freeze all the rest. Take one out when you’re ready to eat, pop it in the toaster oven, and you’re all set. Freezer to toaster oven treats are the best! Sometimes it’s not so much about not knowing who you are, but acknowledging that you can be lots of different things, at lots of different times, to lots of different people. And it’s totally cool. As long as you’re good, and you know you’re good, labels will never matter. Combine the flour, cornmeal sugar and salt in a bowl and whisk together. Use a pastry cutter or your fingers to cut the butter and shortening into the flour until they become pieces the size of peas. Add in the egg yolk and water, adding more one tablespoon at a time until the dough JUST comes together. Be very careful not to overmix the dough. As soon as it comes together, don’t knead it any further. Divide the dough in two, form it into rectangular pieces, wrap and chill in the refrigerator for at least 30 minutes and up to over night. 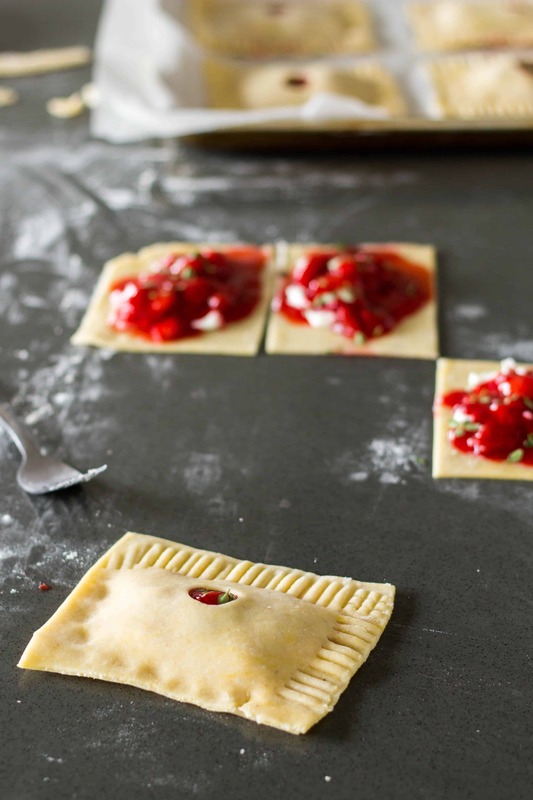 While the dough is chilling, prepare the filling. 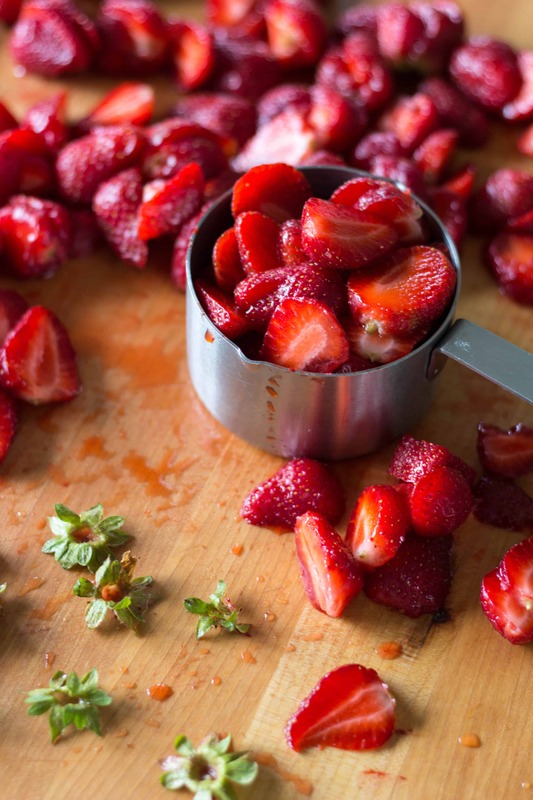 Combine the strawberries, sugar, corn starch and salt in a medium sauce pan. Bring up to a boil, then reduce to a simmer, and cook until thick, about 5 minutes. Set aside and allow to cool. 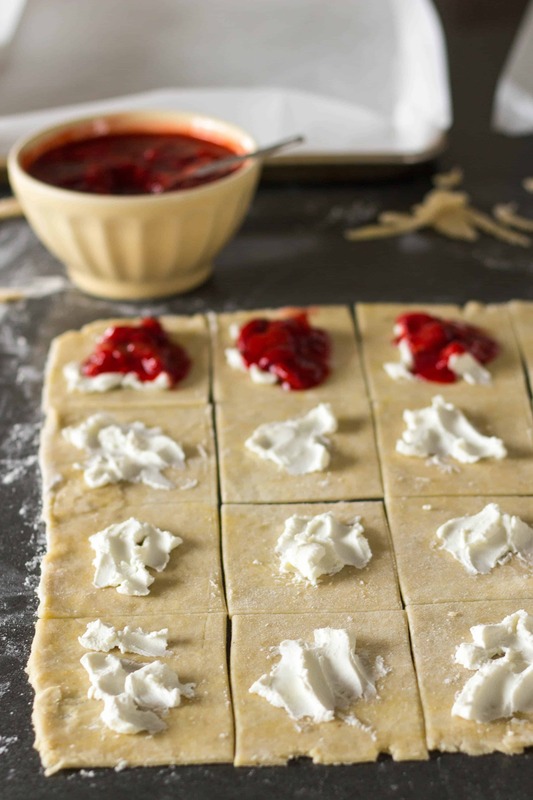 Roll out each rectangle of dough on a lightly floured surface to about 14″ wide and 18″ long. Trim the excess to square off any uneven edges and then cut 16 even rectangles out of each – 4 long x 4 wide. 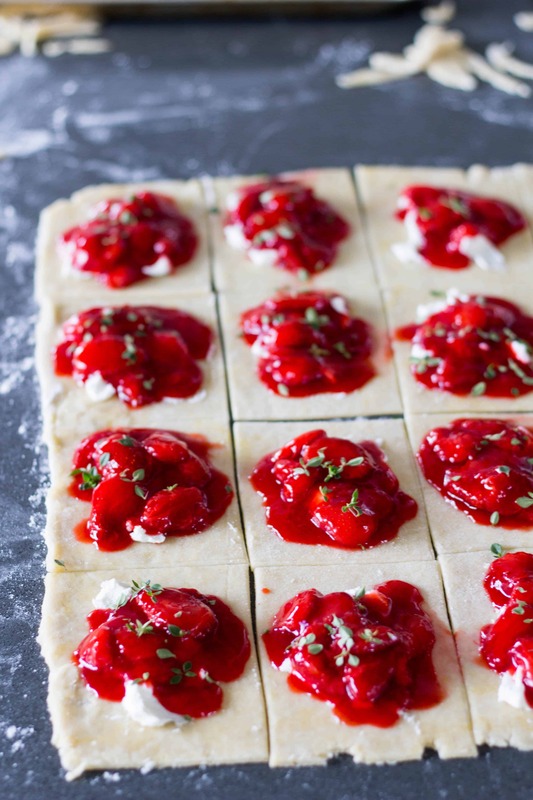 Divide the goat cheese evenly among half of the squares, then top with a heaping tablespoon of strawberry filling. Sprinkle each with the lemon thyme, reserving some for the tops. Cut a vent in the remaining 16 rectangles. I used the back of a pastry tip to make a little hole, but you can use a knife or small cookie cutters. Whisk the reserved egg white with a teaspoon of water until it’s broken up. Working one at a time, brush the edges of each vented rectangle and place over top of the filling. 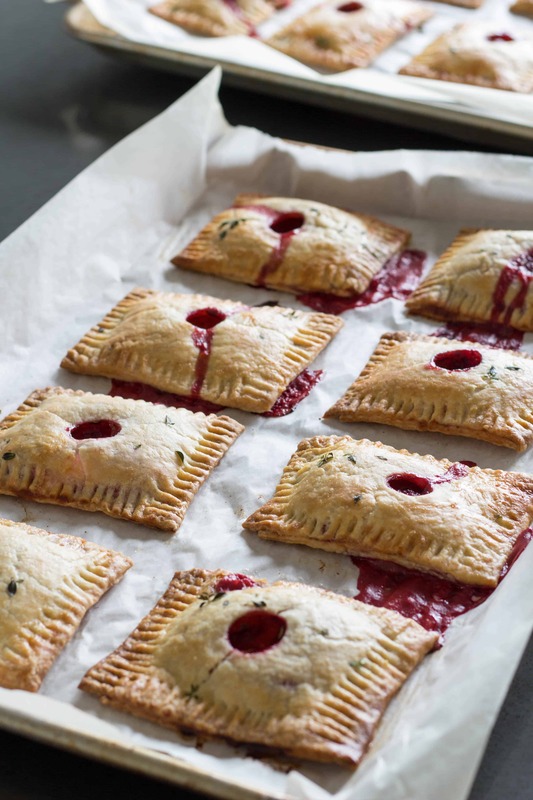 Press down on the edges, then use the tines of a fork to make sure each pastry is fully sealed. Place on a parchment lined baking sheet (you will need two or more to make all 16) and repeat with the rest. 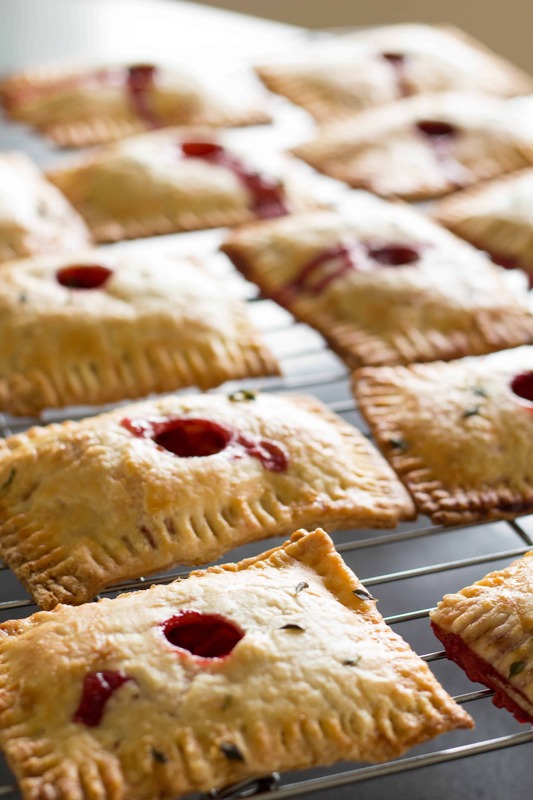 When all pastries are finished, place the sheet pans in the freezer while you preheat the oven to 425 degrees. When the oven is preheated, remove the pans and brush with the remaining egg white and top with a light sprinkling of flaky sea salt and more lemon thyme. Bake for about 25 minutes, or until golden brown. Allow to cool for at least 10 minutes before serving. Be careful – the filling will be very hot. Glad these made it to your blog. 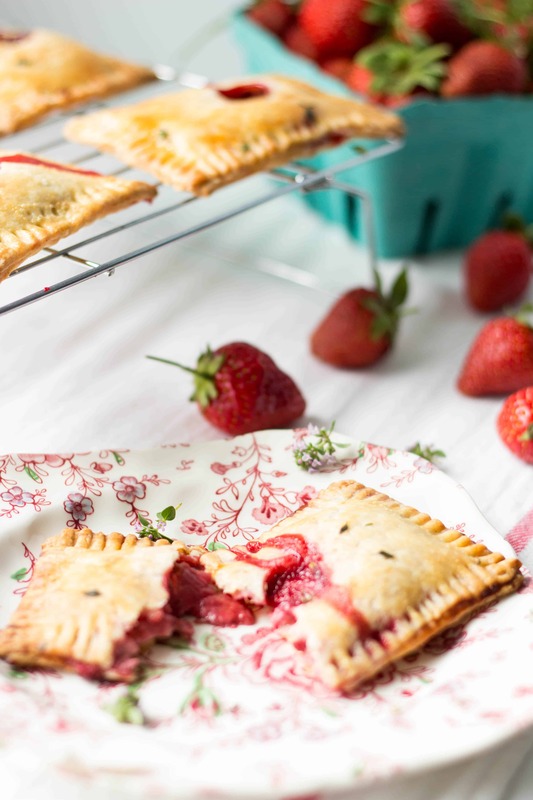 Having grown up on pop tarts to toaster strudel, I am a fan of this healthy, home made version. They are delicious! These look absolutely gorgeous. I’d happily eat one for breakfast AND dessert. I love strawberry season! And, well, goat cheese kind of makes me weak in the knees. Pinning and totally making these this summer. I think these look beautiful! Not a macabre thought in my mind. Can I come over and just eat them? Two beers in and too lazy to cook! MUST. MAKE. THESE… like this week! 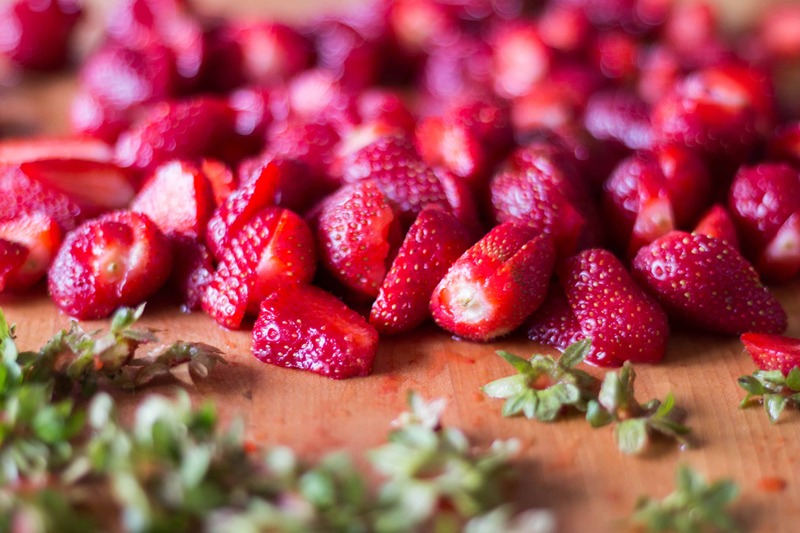 I LOVE goat cheese and what’s not to love about Jersey organic strawberries? Thanks for another winner, Coley!